How can I book a Librarian? 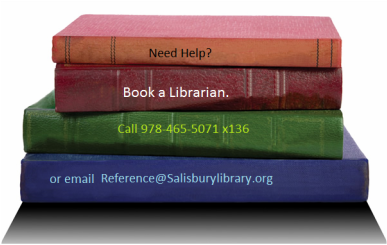 Call the library at 978-465-5071 x 136 or email reference@salisburylibrary.org. Let us know what you would like help with (be as specific as possible) and what day and time of day is most convenient for you. Check with us when you make your appointment. ​To cancel or reschedule please call 978-465-5071 or email reference@salisburylibrary.org.